Why choose this style of garden pond? For someone that wants everything, make an impact in your garden. Ecosystem ponds in the UK are freshwater rock pools. That you can enjoy in your british garden. Pools and hot tubs are great for humans to enjoy sure. But this technology should not be crossed over to garden ponds. Traditional garden fish pools can be ugly when you look under the surface, bare liner and plumbing all on display. These ugly mechanics detract from the overall enjoyment of the water feature. Are they worth the extra time and cost? That comes with the maintenance they require to keep them clean and to run smoothly? Why not have us install something that not only needs minimum support. Since it can practically maintain itself but also contributes to a better planet because of how natural it is? Ecosystem ponds are human-made, yes, but they are natural ponds. That operate in a way that lessens the amount of maintenance required to keep them operational. Primarily, these ponds almost run themselves so that you can make the most out of them! Ecosystems are the best type of water feature for everything. As not only are they attracting all sorts of wildlife. Garden Pond Fish will also be very happy swimming around. An ecosystem pond is better for your wallet and better for the environment long term! To learn more about ecosystem ponds. Whether its a case of you want us to create a masterpiece. We are now talking about the water garden of your dreams. Or you might want more information to build your very own piece of paradise. Scroll on down to understand more and discover what makes these ecosystem ponds tick. I will answer these topics: What they generally look like, and the costs that are involved. What is an ecosystem pond in the UK? We love building ecosystem ponds. The pond fish, frogs, plants and even right down to the microscopic organisms. Are all part of a pond ecosystem, its all about balance. Like different kinds of bacteria (don’t worry, bacteria is a normal part of any pond. However not all bacteria is bad bacteria some is very beneficial). The energy from the sun, all work together within their environment. By definition, an ecosystem is “a biological community of interacting organisms and their physical environment or (in general use). A complex network or interconnected system”. An ecosystem pond is just that: each part of the pond ecosystem. Is in constant communication with the other parts, and they work together to maintain the pond ecosystem. These water features also help to combat the declining populations of that certain wildlife by giving them their oasis. This garden pond ecosystem also extends to the ecosystem of the homeowner’s garden as a whole. Then further to the ecosystem of the entire region. When there are multiple, similar ecosystems reacting in one area. These are the Five Elements of a natural garden pond ecosystem. Manufactured waterfall filters that just blend into the surrounding landscape (no need to hide or house the pond filtration units away from the pond). These waterfall filters provide all the biological filtration the first step to a healthy ecosystem pond. This durable rotational-moulded polyethylene is strong enough to withstand anything that mother nature should throw at it. This filter is the basis to your waterfall or the start of your very own little garden stream. What it does is it provides a large surface area for that previously mentioned beneficial bacteria to grow and colonise, which then, as the water passes over it, remove the excess nutrients from the water to keep your pond balanced and clean (i.e. green fish ponds are really just ponds with too many nutrients!). In these waterfall filters you have a couple of different types of filter media. These types of media can be made up of Lava Rock, plastic filter media called BioBalls, as well as filter pads; these units filter out all the little hasty and other harmful stuff within the pond water like little scrubbing brushes that just end up feeding that horrible look green water in your garden pond. Another part of this filtration system is a proper pond skimmer or mechanical filter. This part of the pond not only pre-filters the water and houses the pump that pumps the pond water to the waterfall filter, but it also circulates the pond water around the system. It removes surface debris to prevent the buildup of organic material on the pond floor before it has time to sink. The skimmer has the benefit of a large collection basket. The basket is very easy to take out and tip out the talked about surface debris (such as leaves and twigs). The pond skimmers also benefit from a filter mat that rests at the bottom of the pond skimmer. Again as before these filter mats house beneficial bacteria that can be easily washed of or hosed down this pond water when waste buildup occurs. Another benefit the pond slimmer provides it skims of the most highly oxygenated water possible to supply the filter system. It may not seem like such a vital part of maintaining a healthy, well-balanced ecosystem pond, but rocks and gravel are important. Not only because of the protection they provide for the liner of your pond, but they also increase surface area which, again, allows for beneficial bacteria to grow and colonise so that they can break down excess nutrients in the water and dissolved organic debris on the pond floor. Also, the rocks and gravel on the base and sides of the pond provide cover for the pond inhabitants. It’s much easy to get in and out of as well as there is no bare, slippery pond liner. The pond builder can build your very own steps in and out so it is very easy for humans, pets or garden wildlife to get out safely. Pumps and plumbing: that’s all that recirculation system means! The proper size pump and pipe diameter are essential for the aesthetics of a water feature. More importantly, an efficient circulation system keeps the water moving and provides the necessary oxygen levels for healthy pond fish and pond plants. Without it, your water becomes stagnant; when it’s still, it can become a breeding ground for unwanted pests like mosquitos and other nasty critters. Plus, your fish are much happier when there’s more oxygen! The flow rate around these ponds does not let that much waste build upon the base of the ecosystem pond like other styles of a garden pond. In this case, this does not mean your regular goldfish (although goldfish do well in pond ecosystems, too!) you had for a pet as a kid! While it may seem like fish are high maintenance, that is not the case here. Contrary to popular belief, the fish in your water feature play a massive role in keeping your wallet happy! These guys will be grazing on string algae and feeding on the debris at the bottom of your pond; the fish actively reduce the need for pond maintenance. If you have the right amount they will keep the pond ecosystem clean, have too many, and they will be a lot of work. Keeping pond fish doesn’t hurt that they’re enjoyable because of the endless hours of entertainment that can be had from sitting along the water feature and watching them swim around (even jumping out of the water sometimes!). How could you get any more natural than mother nature’s natural filters? Not only do aquatic plants allow for more customisation to your pond by giving you options of adding more colour and texture, but they also thrive in the excess nutrients your ecosystem produces. This, then, deprives bacteria of using those excess nutrients to grow out of control, which then contributes to an unbalanced, unhealthy pond! As long as the plants are given proper coverage, aquatic plants are crucial in maintaining a healthy pond ecosystem. Plus if you don’t have plants you have a pool. Pond Ecosystems Bring your Back Garden Landscape to Life. ● The fish nibble on the plant life (and everything else), including the algae. ● In turn, the fish produce waste that, along with other forms of natural debris, which is then collected in the pond skimmer. ● Debris is broken down by the aerobic bacteria. Microorganisms colonised everywhere in the pond not only in the filter system but on the rocks and gravel all over the pond surfaces. So if you don’t have power the pond carries on processing the waste. ● Once broken down substances are absorbed as nutrition by the plants. ● The plants grow and are once again nibbled on by the fish … ’round and ’round it goes, infinitely. Again, going back to the definition of an ecosystem, creating this infinite cycle allows for better peace of mind and leads to more and more enjoyment and entertainment from your pond! This cycle dramatically reduces the amount of time and money that needs to be spent maintaining your pond. With less maintenance, you can just sit back, put up your feet, and relax while the pond does its own thing work for your enjoyment! In reading this article, did you find yourself feeling more and more of a compulsion to have an ecosystem pond of your own? Take the first step! In terms of specifications, these ponds normally range in size: from 2.4m by 3m, to 6m by 6m. Ecosystem Pond Package Prices start from as little as £4,995 for the 2.4m by 3m pond right up to the 6m by 6m Ecosystem Pond Package Priced at £24,984. But these prices depend on what you’re looking for if you want extra pond enhancements or a larger pond. We have optional upgrades and lots of pond enhancements, like natural wetland filtration these are the answer for keeping more koi carp in your newly built ecosystem pond, other enhancements might include rainwater harvesting systems, underwater pond lights, fish caves & tunnels then you want to protect your fish, adding a stream is also possible or increasing the height of your waterfall. What something different how about a natural looking pond with a negative edge. Water that simply overflows down a watercourse into a bed of gravel so the water just disappears. For these upgrades, prices vary depending on what you have in mind. It’s up to you what kind of paradise you want us to build you! These kinds of ponds are not pre-built to be directly installed and are generally designed with a more natural look in mind, they are not usually perfectly symmetrical; rather, these ponds are composed of many curved lines and odd shapes that would be more likely to appear in nature. These asymmetrically shaped ponds can be made to look very natural in any landscape. We adopt the local earth tone colours and enhance the water feature with natural elements like local moss, driftwood, and natural stone. With that said, these natural ecosystem ponds are works of art and are the best living displays that money can buy! We are specialists in residential pond construction, pond care and maintenance, and of course pond repair and upgrades. 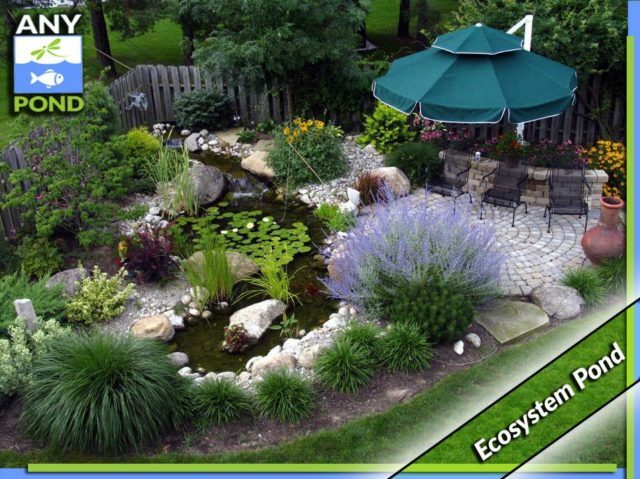 We will help you with your very own ecosystem pond construction estimate today! If you can’t decide on what type of pond you like why not go for a hybrid. Have a look at the picture below. As you can see this pond is a hybrid of an ecosystem & basic pond with the pump in the bottom and bare liner but above the water, you have the look and feel of an ecosystem pond. This pond also has a small wetland filter at the top of the 8′ stream.